August 2013 - Bring It! It’s the end of summer, you can’t go a day without eating corn because it’s so darned good, and zucchinis appear in your car when your back is turned. What’s a girl to do? 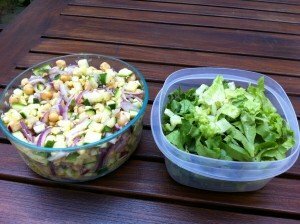 Make this salad! I almost didn’t make it because it looked so simple. That was a week ago and now I’ve made it three times. I even put it to the Bring It test, delivering it with a loaf of easiest french bread ever. It meets all the Bring It criteria, especially the part about being EASY. For the Vinaigrette: In a small bowl, whisk together the lemon juice, olive oil, salt, and pepper until combined. 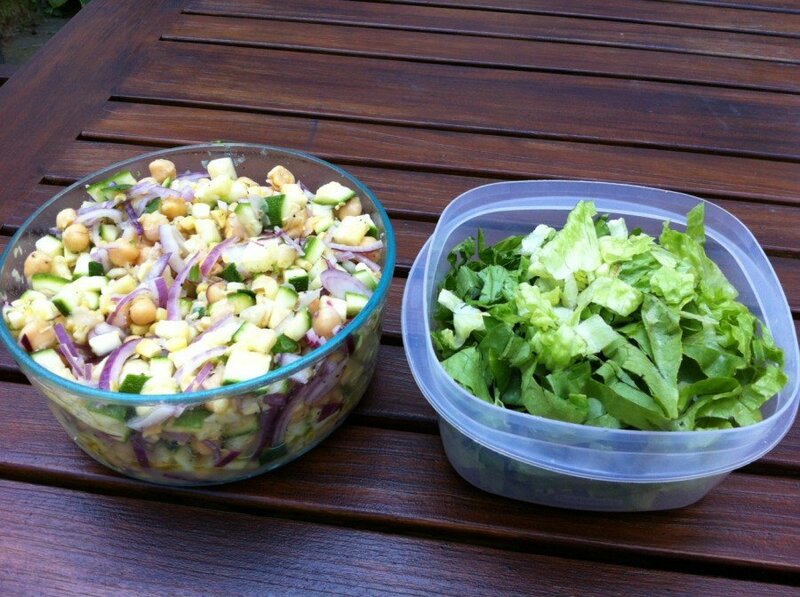 For the Salad: Place the garbanzo beans, zucchini, corn, red onion, and lettuce in a large salad bowl. Pour the vinaigrette over the salad and toss well. Garnish with the crumbled Parmesan cheese and serve. Cut the romaine and put it in a sealed container. Combine all other ingredients (except the parmesan), toss with dressing and put in another sealed container. I actually like to let it sit a bit in the fridge to make the onions less aggressive and to let the flavors all schmooze together. Just before serving combine both containers into a serving bowl, toss and add the parm on top. To be totally honest I have yet to add the parm but I’ll bet that takes this over the top. 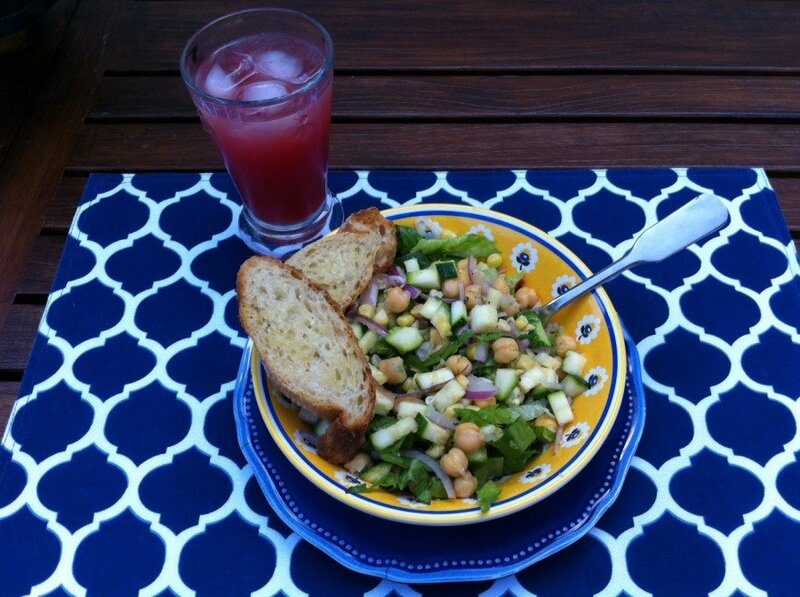 This entry was posted in Salads and Sides on August 30, 2013 by Edie Morgan. I don’t think it’s going to get any better than this. Summer that is. And whatever else I might find to put in this glass. This recipe comes straight from Joy the Baker, with gratitude and reverence. If you don’t follow Joy you should. She’s smart, funny, and wildly successful at creating ridiculously good food and drink. And she does not fuss. When I saw this recipe I immediately thought, “Great! 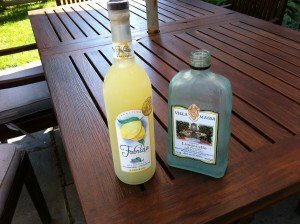 A way to use up those three half bottles of Limoncello in my freezer.” Flash forward a month later and there I am making up an excuse to go to the grocery store so I can really go next door and buy Limoncello. Trust me though, this is worth a new bottle of Limoncello. So as I said this comes straight from Joy the Baker BUT I have notes for practicality. Joy lives in urban California where a “small” watermelon is the size of a small melon. I live in rural NH where a small watermelon is the size of a large baby. Plan accordingly. Joy muddles things artfully in stages and I slammed all the fruit together in a blender. Also, if you’re wondering if you can store the leftovers a la freezer daquiris, wonder no more. Yes! In fact the entire first batch (which my impatient not-gonna-go-to-the-store-one-more-time self made with boxed pinot grigio and no strawberries) went straight to the freezer and was a darned good consolation prize between batches. It has no high fructose corn syrup laden limeade in it though, so the texture ends up more icy. Enough said. Dig out that Limoncello and prepare to be refreshed! 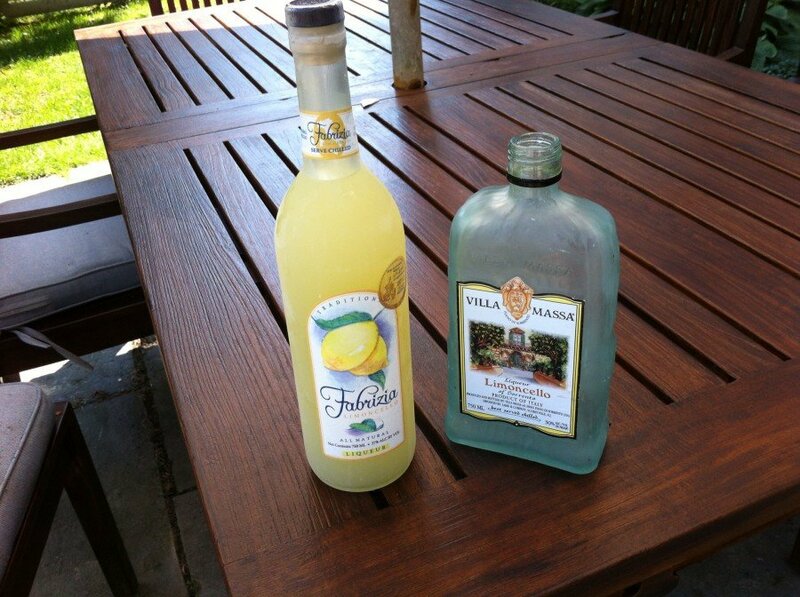 Limoncello. Out with the old, in with the new. The rose of choice. 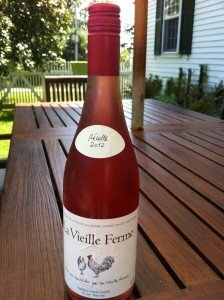 French, screw top, cheap. All good! Slice a watermelon into large chunks. Reserve a few smaller chunks for the sangria jar and for garnish. Blend watermelon chunks with a handful of sliced strawberries until smooth. Depending on the size of your blender, you may need to blend the fruit in two batches. Strain fruit juice through a fine mesh strainer and into a large measuring cup. You’ll need about 4 cups of watermelon/strawberry juice. 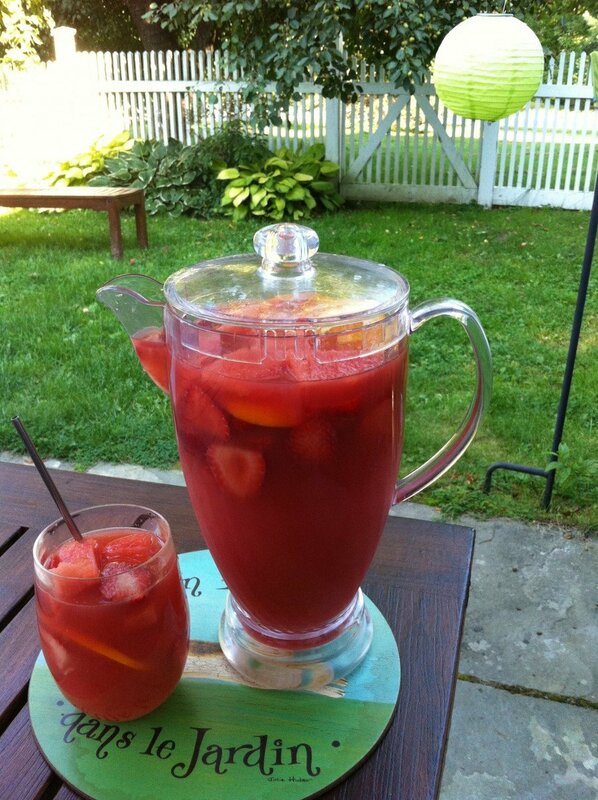 In a large container stir together, watermelon/strawberry juice, wine, vodka, limoncello, orange juice, and lime juice. Stir in the remaining sliced strawberries, a few watermelon chunks, sliced oranges, and sliced lime. Chill thoroughly before serving. Serve over ice. This entry was posted in Sips and Slurps on August 21, 2013 by Edie Morgan. When my friends and I go away we pair up for meals. Each pair is responsible for breakfast, dinner, and dishes for one day of the trip. When your day is over you can kick back and relax for the remainder of the trip. As you can imagine, this method of dividing into cook teams has become a fierce competition. At the end of the week we vote for who made the best meal. Last trip the spaghetti squash enchiladas won hands down. Jeannie Wall came to the table with this winner — darn her for being good at everything! We are just glad she shared the recipe. It is ridiculously good. 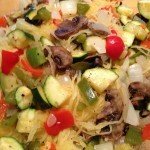 Toss peppers, onions, mushrooms, and zucchini with olive oil, salt, and pepper. Roast for 30 minutes, until tender. 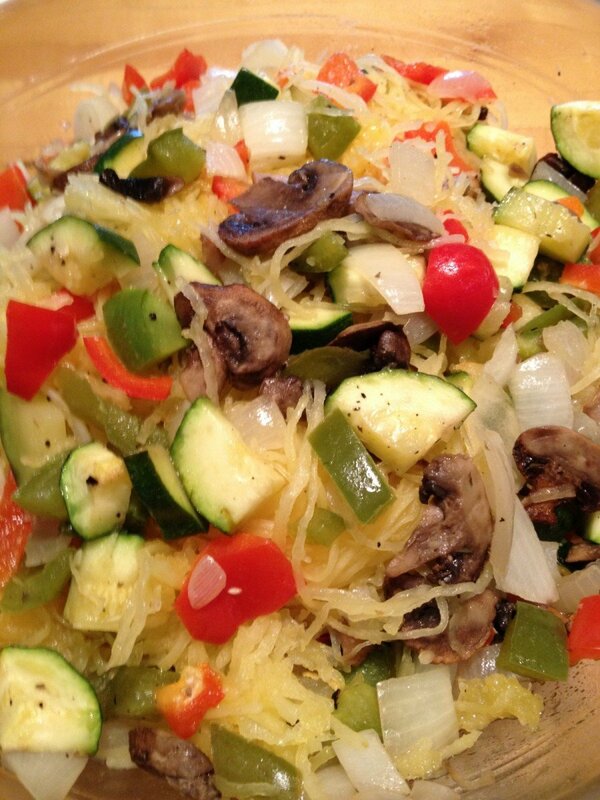 Combine with cooked spaghetti squash. And since it is corn season when this post is going up, I added fresh corn right off the cob. 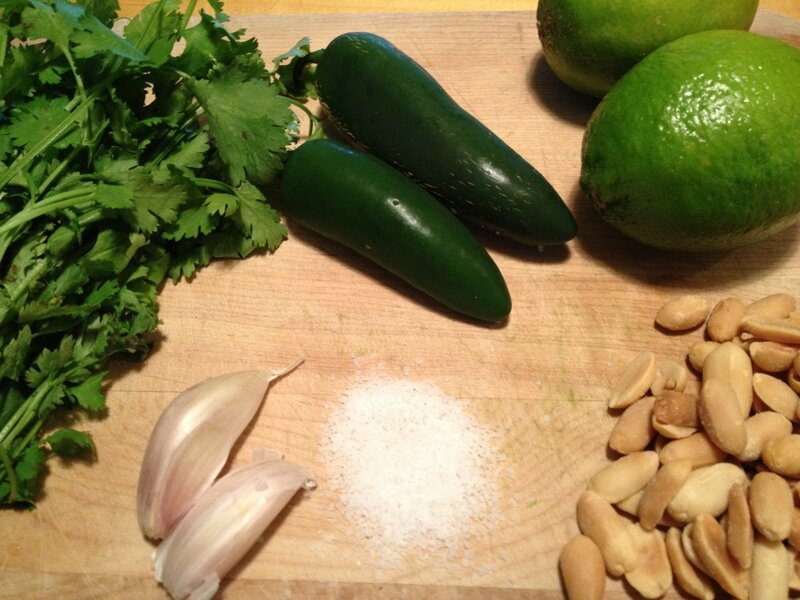 Combine ingredients for cilantro pesto and stir together. Combine ingredients for Thai sauce and stir together. Pre-heat over to 350 degrees. Coat 9 x 13 pan with cooking spray or rub with oil to prevent sticking. Heat tortillas and spoon in squash mixture. Add one tablespoon of each sauce plus cheese (make sure to have enough cheese left to sprinkle on the top). Set stuffed tortillas in pan. Once all tortilla are made, cover with salsa, more cheese, and tin foil. Cook for 30 minutes, then remove foil and cook 10 more minutes until top browns. Bring already cooked enchiladas in pan and re-heat when you get there. Or, if not eating that day, bring items in tupperware and assemble when ready to cook. Oh, and if there is any sort of a competition, you will win. If there is no competition – start one! This entry was posted in Main Dishes, Veggie Delight on August 20, 2013 by Sue Hanlon. In case you can’t get to Italy this weekend this is your consolation prize. It’s another find from Sunset magazine. So good, so satisfying. I started making this because I have a slight obsession with eggplant and because we were visiting Vegans (with a capital V–they were serious). I quickly realized this was equally appealing to carnivores, and downright meaty in texture and heartiness. The Vegans had to share. A vat of this in the fridge, with or without the toasts and ricotta cheese, and you are set to make a meal out of pretty much anything. 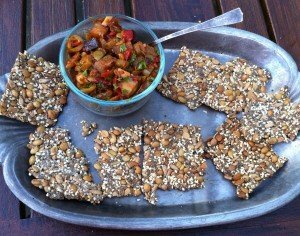 Perfect for bruschetta deconstructed and as a spread/filling/topping with crackers, wraps, omelets, tortillas, or accompanied by your carb vehicle of choice. Preheat oven to 350°. Lay bread on a baking sheet and drizzle with about 2 tbsp. oil. Bake until toasted and light golden brown, about 5 minutes. Set aside. Heat 2 Tsp oil in a large nonstick frying pan over medium-high heat. Cook eggplant, stirring often, until softened and starting to brown, about 8 minutes. Transfer to a bowl and set aside. In the same pan, cook garlic in remaining 2 Tsp oil, stirring, until fragrant, about 1 minute. Add celery, bell pepper, and olives, stirring to combine, and cook until softened, 5 to 8 minutes. 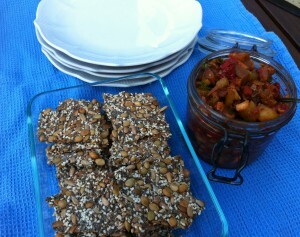 Stir in 1/4 cup water, the vinegar, tomato paste, raisins, and pine nuts and cook until heated through. Stir in reserved eggplant, salt, and sugar, then mix in herbs. Spoon cooled caponata into one big or several small mason jars and make a label if you’re feeling fancy. Official word is to chill caponata up to 2 days in the fridge and store toasts airtight up to 2 days but I’ve pushed it out way longer with no scary consequences. 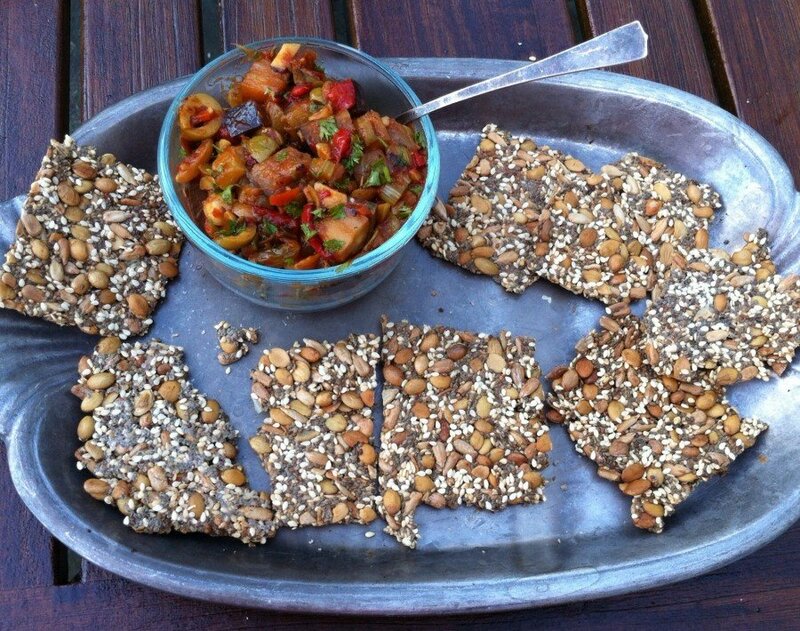 Caponata with Endurance crackers fresh from the cooler. 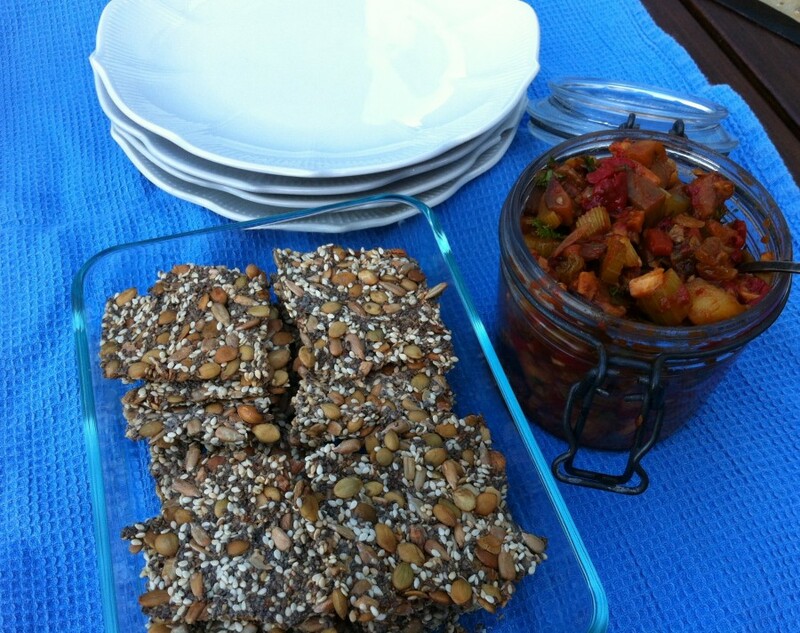 This entry was posted in Appetizers, Veggie Delight on August 2, 2013 by Edie Morgan. Sawyer on his 2nd piece! Edie’s son told her she had to post “those bacon wrapped thingies” on our blog. 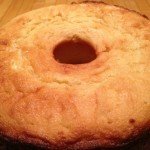 My son told me I had to post “that lemon-y lemon cake”. He said that lemon cake is the best dessert he has ever tasted IN HIS LIFE! 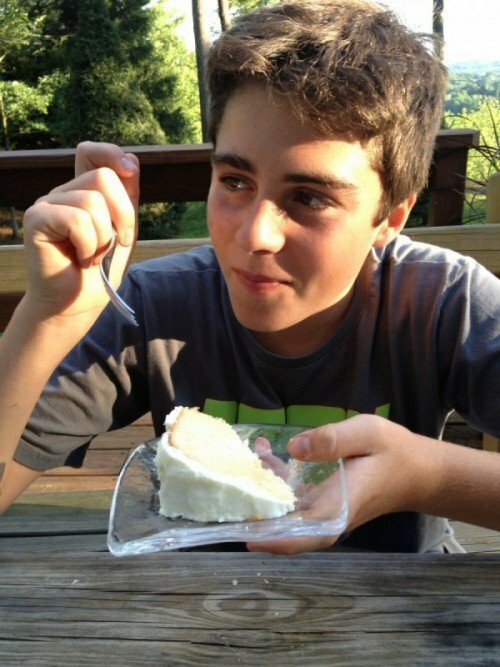 At 13, he’s not exactly a connoisseur but, he’s been around long enough and sampled enough desserts to be a trusted source. 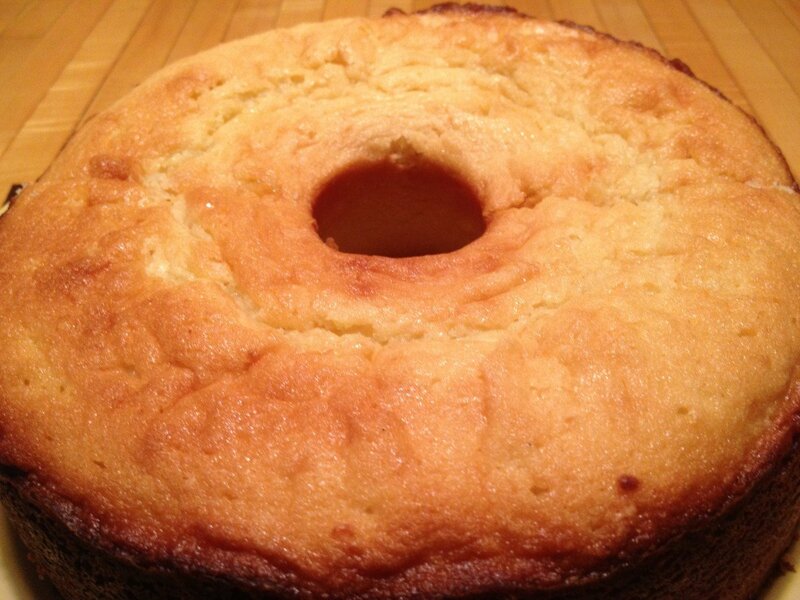 So here it is, courtesy of my son Sawyer, the Glazed Lemon Cake straight from the Silver Palate Cookbook. If you own the cookbook, grab it off your shelf and make this cake now. If you don’t own the cookbook, you should strongly consider this purchase. Every recipe is a winner. In the meantime, here is the recipe, straight up, no modifications. 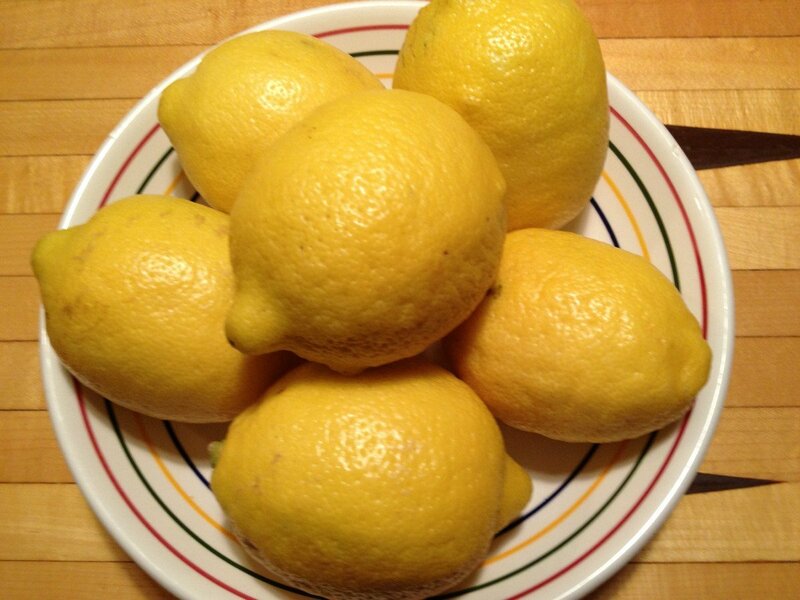 And my motto…..if you have lemons, make lemon cake! Preheat oven to 325 and grease 10 inch tube pan. Cream butter and sugar until light and fluffy. Beat in eggs, one at a time, blending well after each addition. Sift together flour, baking soda, and salt. Stir dry ingredients into egg mixture alternating with buttermilk, beginning and ending with dry ingredients. Add lemon zest and lemon juice. Cook cake in pan for 10 minutes. Remove cake from pan and spread icing on it while cake is still hot. Cream sugar and butter thoroughly. Mix in lemon zest and juice. Spread on warm cake. The frosting can pack quite a PUCKER. 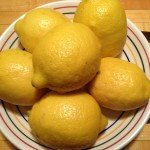 You can tone it down a bit depending on your tastes by cutting the lemon zest and lemon juice amounts by maybe a third. We all love the pucker at my house so we go full tilt. Full disclosure, this cake is a bit of a mess. Bringing this cake from your kitchen to a party, well, it might not be pretty but it will still taste great. If you have one of those round cake Tupperware containers, perfect. Use that. Or, you can bring the cake unfrosted on a plate wrapped in foil. 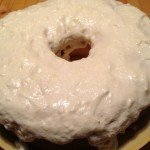 Transport the icing in a separate container and frost when you get there. Also, adding fresh fruit to the top, such as blueberries or strawberries would be a great addition. Enjoy and pucker up! 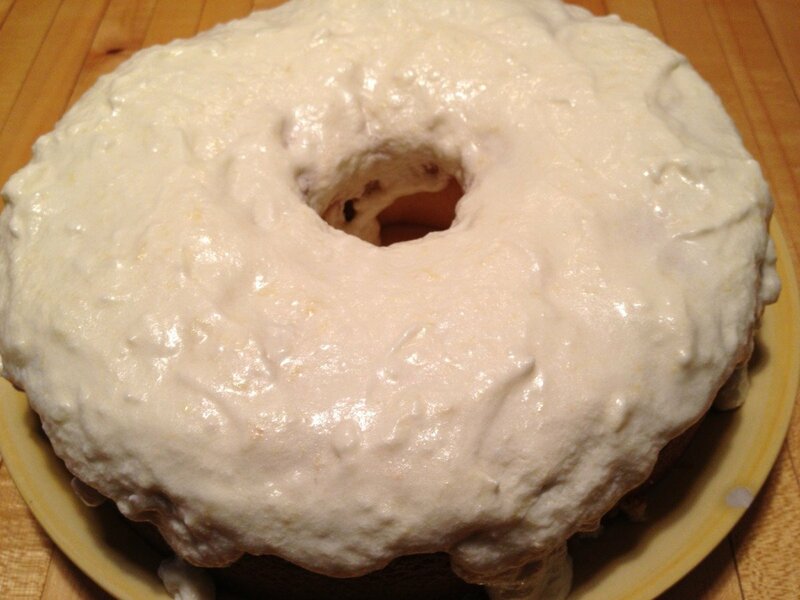 This entry was posted in Dessertalicious on August 1, 2013 by Sue Hanlon.